The Ashes build up in the media was overwhelming to say the least; but that was nothing compared to the over drive they went into today. I woke up to over a 100 new entries in my RSS Reader. That has never happened before and I have over a 100 blogs and sites that I subscribe to! It goes without saying that almost all of those new entries was something or the other about the Ashes, which kicked off today. 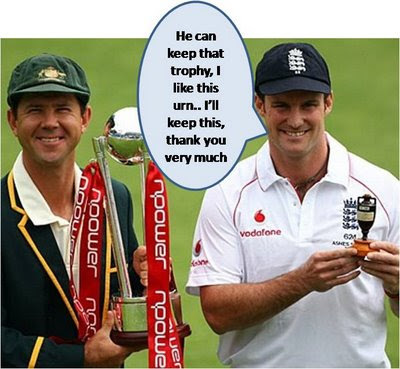 Anyhow, so here are my two bits about day 1 of the Ashes. Australia have as many as 7 Ashes debutants in their line up. Only Ponting, Katich, Hussey, and Clarke had played an Ashes test before today; meaning that Australia's entire bowling attack is playing their first test against England. 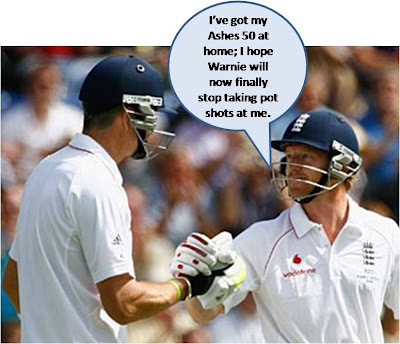 On the other hand, England have only 4 Ashes debutants - Bopara, Prior, Broad, and Swann. Nathan Hauritz 1st Ashes wicket was Kevin Pietersen; not bad was it. Now for some hearsay from Day 1. The hype as you pointed out was overwhelming. When an event like IPL is likened to wheel/fire/internet and Lalit Modi is called 'Moses of Cricket' or some such thing by brayer-in-chief Shastri, I think it is fair that the English and Aussies bask in the attention now. I'm surprised the England team crossed 325. It seemed like a team effort. But they are ever so unpredictable like Pakistan. Who knows an upset might be on its way? Australia are not invincible anymore. Even moreso when the test started! I was also pleasantly surprised to see England post a big total.. many were saying it was even end of day 1.. I think England were ahead.. but now Australia are sailing and will prob get a lead as well..